The midfielder’s dismissal comes just two weeks after Papy Djilobodji was also sacked by the League One club. Ndong reported for duty today, and was sacked straight away. 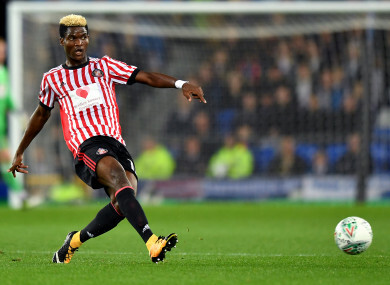 SUNDERLAND HAVE TERMINATED Didier Ndong’s contract after he failed to return to the club for the start of the season. The Gabon midfielder — who spent the second half of last season on loan at Premier League side Watford — was dismissed by the club on Monday after belatedly turning up at the club’s training ground. Ndong’s dismissal comes less than two weeks after defender Papy Djilobodji was also sacked by the club for refusing to return for the start of their League One campaign. A statement on the club’s website, read: “The player, who was under contract with the club until June 2021, failed to return to Sunderland for pre-season training in July as scheduled, nor in the subsequent months that followed. Ndong was Sunderland’s record signing after he cost the club £13.6 million in 2016, when he was signed by then manager David Moyes from Lorient on a five-year contract. Email “Sunderland sack record signing Ndong after he went AWOL all summer ”. Feedback on “Sunderland sack record signing Ndong after he went AWOL all summer ”.